Muddy says: Famous for its sourdough pizzas and impressive menu of cocktails, fine wines and beer, Chapter is the perfect place to gather with friends or dine with family. 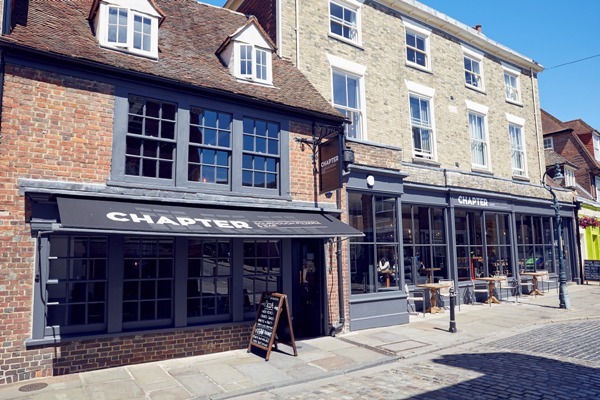 Chapter is positioned at the top of Burgate, one of our fave Canterbury streets. A beautiful cobbled lane in a historic part of town where there’s a good selection of independent shops nearby for you to scratch a credit card itch after you’ve eaten. Pizza of course is the star attraction here and, boy, do they do them well (we should know, we’ve eaten our way through a few!). We love their Melanzane Parmigiana (roasted aubergine, tomato, baby plum tomatoes, fior di latte and parmesan – since you asked). With booth sitting options which would work well for small groups/cozy date nights or lovely tables for two in the window so you can watch the great and good of Canterbury saunter by. There’s also a very good space upstairs which is perfect for private hire with capacity for 40 people sitting down. There are plenty of catering options including antipasti boards, pizzas (obvs) served with sides of salad and mac ‘n’ cheese plus puddings as well as canapés. Enjoy a Bottomless Brunch every Saturday served between 11am to 4pm. Or if it’s not only pizza you’re after, there’s a good choice of salads too as well as lasagne, mac’n’cheese or melanzane all cooked in their wood oven. The kids menu is a main – choose from margherita pizza (with one topping), lasagne, mac ‘n’ cheese, or pasta with ice cream and sprinkles to follow all for a brilliantly reasonable £5. A really reasonable and decent dining option considering portion sizes and yum factor.